TEXARKANA, Texas – Officials from Texas A&M University-Texarkana and Northeast Texas Community College in Mt. Pleasant recently signed several new articulation agreements between the two institutions. These agreements, sometimes called 2+2 plans, lay out a specific pathway between two institutions so that students can easily transfer from a community college to a four-year university and know what they need to complete a particular degree program. The six new agreements link associates degrees from NTCC to Biology and Chemistry degrees at A&M-Texarkana, four of which include teacher certification. Texas A&M University-Texarkana’s Dr. David Yells, Provost and Vice President for Academic Affairs, believes that agreements like the ones between A&M-Texarkana and NTCC are instrumental in helping transfer students achieve their goal of graduating with a bachelor’s degree. “Providing a clear roadmap for students to follow as they navigate the increasingly complicated landscape of higher education is essential for their success. We are pleased to have such a dedicated partner as NTCC as we continue to develop these agreements,” commented Dr. Yells. Students who enroll under these new programs will complete their associate’s degree requirements on the NTCC campus and will attend classes at A&M-Texarkana to complete their undergraduate degree. With the addition of these new programs, there are now 28 such agreements between the two institutions. 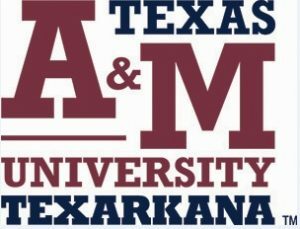 TEXARKANA, Texas – Texas A&M University-Texarkana and The East Texas Writing Project are sponsoring the 28th annual Young Writers Workshop July 16-27. The workshop, which is open to students entering the 1st grade through the 12th, focuses on age-appropriate material for each grade level. The cost for the two-week workshop is just $40 per participant. Dr. Corrine Hinton, who runs the program at A&M-Texarkana, says that while many universities charge between $150 and $300 for this type of application, A&M-Texarkana intentionally sets prices much lower. “We want to give as many children as we can the opportunity to come to this program. We want to give these students an outlet to write, create, and express themselves,” Hinton commented. Each participant will receive a T-shirt and other A&M-Texarkana items, along with an anthology of their work. The university puts together a book of everything created during the week so the students will have a way to take it with them. Registration will continue until all spots are filled and will be available the first day of the workshop provided seats are still open. For more information or to register to contact Dr. Corrine Hinton at chinton@tamut.edo or you may visit http://www.tamut.edu/young-writers/. As a member of The Texas A&M University System, Texas A&M University-Texarkana is a comprehensive regional university that provides students with academically challenging, engaging and rewarding educational experiences through quality teaching, scholarship, student support services, co-curricular programming, research, and service.